Set off from Southampton, 10th April 1912 with 2,223 Passengers and Crew. Hit an Iceberg at 11.40pm on the 14th April 1912. 706 persons saved, 1517 perished. Titanic was found in 1985 by Jean-Louis Michel and Robert Ballard in 3,925m of water, 1,000 miles East of Boston. 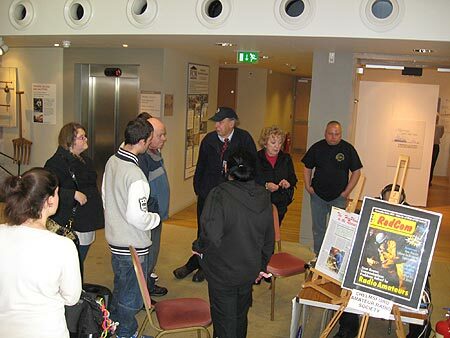 To commemorate this centenary event the Chelmsford Amateur Radio Society transmitted from Oaklands Museum, Moulsham Road, Chelmsford at the invitation of Chelmsford Borough Council on Saturday 14th and Sunday 15th April 2012. 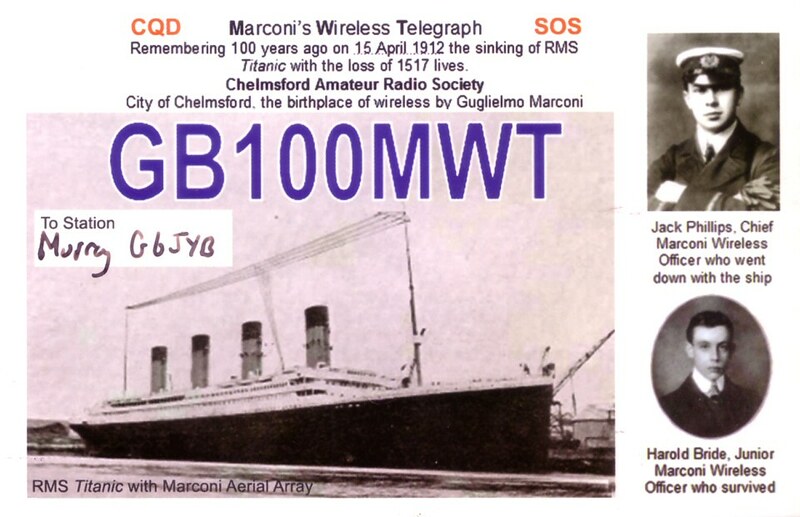 Ofcom granted CARS the use of the Special Call-Sign GB100MWT to commemorate the involvement of Marconi Wireless Telegrahy 100 years ago. 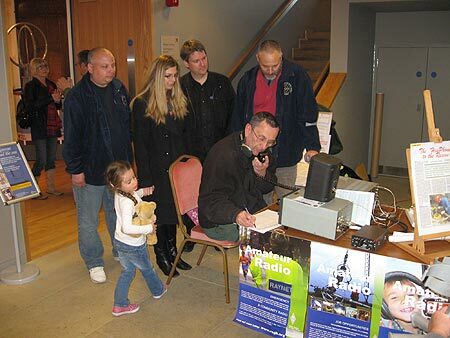 Other Amateur Radio stations around the world active included the the White Rose Radio Society in Belfast using GI100MGY where the RMS Titanic was built; and the Wey Valley Amateur Radio Society using GR100MGY in recognition of Jack Phillips, the Senior Marconi Wireless Operator who sent out CQD and SOS for hours before perishing. Marconi and his Wife, Beatrice had been invited to travel to America on the RMS Titanic at the expence of the White Star Line but due to business Marconi himself travelled a week earlier on thr liner the SS Lusitania. His Wife could not travel with him or go on the RMS Titanic due to their Son, Giulio having a very bad cold. Beatrice together with their Daughter, Degna watched from their house on the Solent as the RMS Titanic sailed by. Jack had been requested by Captain Smith to be the Senior Wireless Operator on the Titanic but this request was blocked by Bruce Ismay, Chairman of the White Star Line. This was the last straw for Jack who had also fallen in love with a young lady in America - he announced his resignation from Marconi and was offered a job on a New York Newspaper. To keep his appointment Jack had to sail on 7th April from Liverpool on the Minnehaha to New York. The RMS Titanic sailed from Southampton on Tuesday, 10th April calling in at Ireland before crossing the Atlantic. The previous week the weather was atrociuos with huge waves but as the Titanic pressed towards New York the sea was without any waves - it was also a moonless night on the 14th - something many seamen have said has never occured again at that time of the year. Lookouts on ships normally rely on the reflections from the Moon to see waves breaking on the Icebergs - this night there were neither. The Icebergs were very far South and we now know they were "Fresh Water Icebergs" which ride in the sea differently to a "Sea Water Berg". At least six iceberg warnings were received by the Titanic and taken to the bridge as was normal custom. The Titanic was travelling at about 22 knots and when the warning was given that an Iceberg had been seen - nothing could have been done in the time before it stuck. The Leyland ship, the SS Californian had Marconi Wireless Operator Cyril Furnston Evans on duty during the day and he had received a number of Iceberg warnings from the RMS Baltic, Dutch Liner Noorham, Cunard liner RMS Caronia as well as the German ship the Amerika. These were correctly taken to Captain Lord who noted them. At 10pm Captain Stanley Lord encountered a patch of ice and wisely stopped engines until daybreak. The Californian saw a ship approching which they considered must be the Titanic. Evans listens to some of the traffic from the Titanic. At about 11.30pm Evans tapped out to his mate on the Titanic "Say OM, we are surrounded by ice and stopped" without any formal procedure or Callsign. Since the two ships may have been 12 miles apart the signal from Evans must have overloaded Phillips ears! Phillips barked back "Shut up - shut up You are jamming me - I am working Cape Race." Evans realised he had upset Phillips - he took off the headphones and went to bed. At 11.40pm the Titanic struck the Iceberg and began sinking. Captain Smith instructed Phillips to send a CQD Message which was followed by the new SOS Distress Messsage. This was heard by a number of ships and shore stations who alerted others. Unfortunately 3rd Officer Groves on the California later in the night had passed the Wireless Room, saw the headphones on the table and put them on - what he did not know was that the Magnetic Detector was clockwork with a 20minute work time - it had run down - Groves heard non of the dozens of loud signals being transmitted. Had he heard the noise - it is thought he may have woken Evans to see what was happening - but it was not to be. The nearest ship was the Carpathia which was 80 miles away and this put on more than "Full Steam Ahead" under Captain Rostron. Dodging icebergs, the Carpathia reached the disaster area at 4.10am to find the Titanic gone and a number of lifeboats and Berthon collapsible boats loaded with very cold persons. In all 705 were rescued together with many of the boats. By 8.30am all that was left was broken pieces of wood and fabric so she set off for New York leaving the Californian to see if anything else could be rescued. The Russian East Asiatic Company vessel called the Birma had a 24 year old Londoner as its Wireless Operator called Joseph Canon but was using De Forest wireless equipment owned by United Wireless. Though they had steamed out of their way for hours, they arrived at the (incorrect ) location given by the Titanic only to find nothing. 5 hours later they encountered the Carpathia but were given initially "Stand by" and later "Shut up" when they enquired as to the latest situation. Joseph left the sea in the early 1920 but remained an Amateur Radio opertor dying in 1966. Unfortunately his logs and testament were never called in either the American or English Enquiries but once the Titanic was found proved accurate. 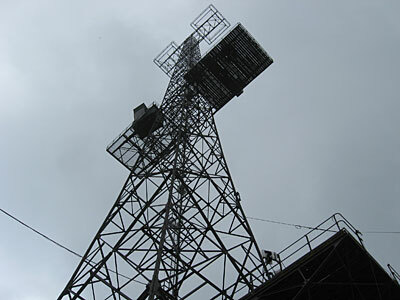 All the Marconi Wireless equipment worked magnificently - without this no-one would have survived. CARS operated continuously to commemorate the saving of 705 persons using Marconi designed and built Wireless equipment in Chelmsford. One must not forget the large number of Marconi trained Wireless Operators involved directly and indirectly on English, French and German ships as well as the shore stations at Cape Ray, Cape Race and New York. CARS were operating included Saturday Apr-14 and Sunday 15th April from BAE Systems, Great Baddow by kind permission of the Director. 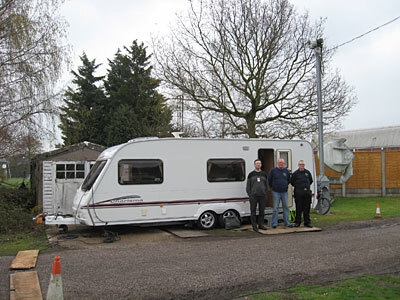 Mark Sanderson, M0IEO brought his lovely caravan and parked it under the 360 foot high Chain Home Wireless Tower to which is attached the aerials. Band conditions were generally poor with a Solar Flux of 5 however the nice high aerial coupled with a hill-top site in a quiet location proved that stations were out there. During a "short" day on Saturday, some 200 QSOs were made. James at the logging computer and visitor Paul G4PVM on the microphone (left photo) and then Mark M0IEO on the microphone (right photo). 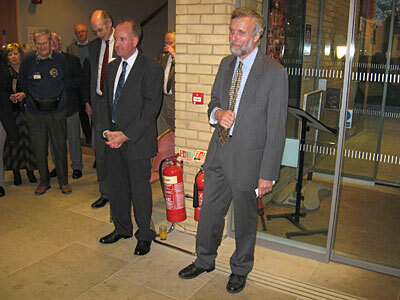 In Chelmsford at 7.30pm, Museum Manager Nick opened the invited audience to Oaklands Museum to the launch of the RMS Titanic and New Street Factory Exhibition. He invited Dr Mike Worboys, Managing Director of BAE Systems, Great Baddow to says a few words. 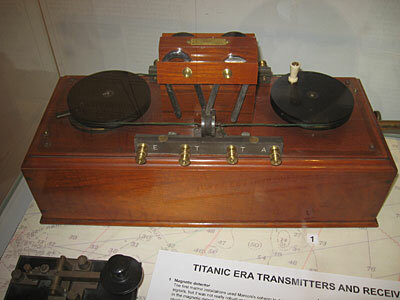 Dr Worboys said he was pleased to be able to loan the beautiful Marconi Magnetic Detector (MD, or Maggie) to the Exhibition as it was typical of the Receivers used on the RMS Titanic and all the Marconi equiped ships and shore stations involved with the saving of 705 persons 100 years ago. Marconi patented the MD in 1902 and it remined in service until after 1918. Dr Geoff Bowles then told how the Exhibition came to fruition with the great work by Peter Watkins, M0BHY and many other "Monday Workers" including Geoff Lovegrove, G7KLV who built the model DF Set. Nick then asked Dr Worboys to formally "Open" the Exhibition. Magnetic Detector No 968910 and Nick, Dr Worboys and Dr Geoff Bowles. CARS operated from the Foyer of the Oaklands Museum, Chelmsford. However due to its centre city location the base noise level was quite high so contacts were a little more difficult. 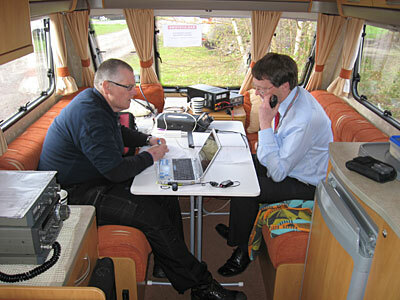 Fortunately due to the efforts of Brian Twhaites, G3CVI and Tony Gilbey, G4YTG over 100 contacts were made around Europe. 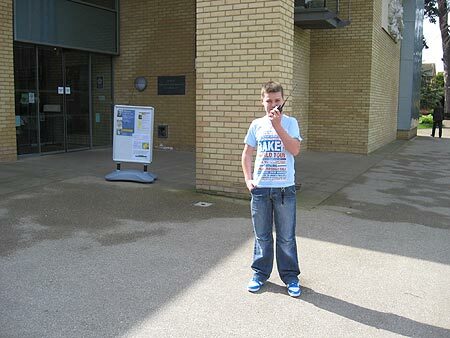 L: Luke operating outside Oaklands Museum as a welcome from CARS. 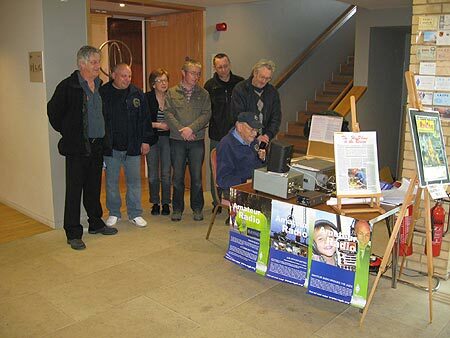 R: CARS Members watching Tony G4YTG contact GB100C for RMS Carpathia. 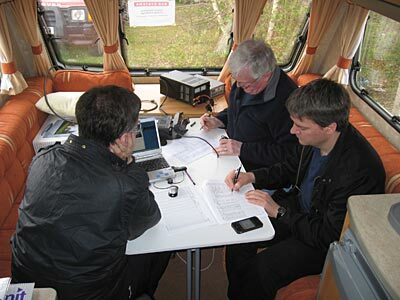 L: CARS Members listening to Patrick Xavier M0XAP operating GB100MWT. 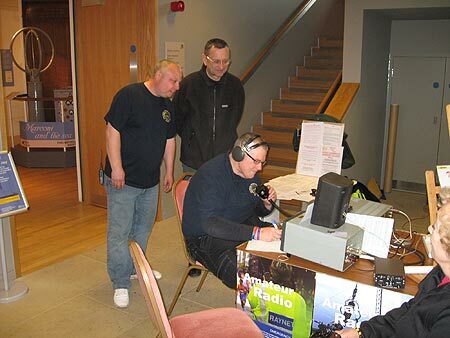 R: PR Manager David Davis G3SVI talking to the public about Amateur Radio. 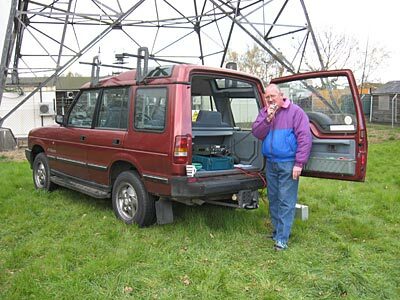 James 2E1GUA operating GB100MWT - he worked some 75 stations. CARS operated from under the Chain Home Radar Tower at Great Baddow. 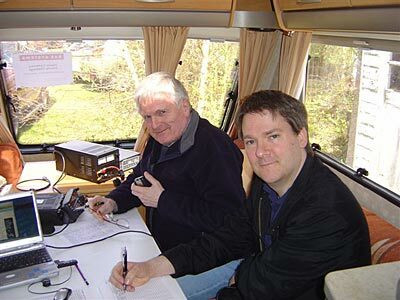 Murray, G6JYB (left) with John G1UZD on the microphone with Peter, M0PSX Logging. John and Peter when distracted - Photo by Colin, G0TRM. The pile-ups were so large the whole team forgot about lunch which was promised in a local hotel! Mark M0IEO working Portable? The Battery Box is in the grass. Some 300 plus stations were worked on the day - thanks to all who contacted GB100MWT and sorry if you could not break the pile-up. Just one of the lovely envelopes received from Canada. (Marconi Station at Cape Race was heavily involved with the rescue 100 years ago). 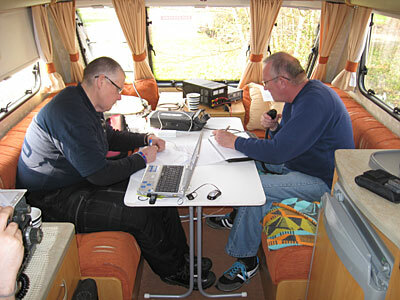 A Special Event GB100MWT QSL Card will be returned upon request.